Rhode Island has a thriving economy, with an anticipated growth rate of more than 10 percent between 2012 and 2022. That translates to more than 51,000 jobs, and many of the enterprises with the highest growth potential – healthcare, construction and contracting, and administrative support services – provide opportunities to those with vocational certificates or associate degrees. Keep reading to find out more about vocational and trade programs in Rhode Island that can launch a rewarding career. Rhode Island's trade and vocational school options are wide and varied. At Rhode Island's many community colleges, career schools and vocational institutions, students might want to obtain skills related to healthcare or manufacturing in order to take advantage of the faster growing job sectors. 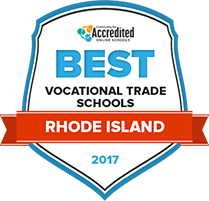 Students seeking the best schools can find them with our rankings of accredited Rhode Island trade schools, as we take into account the points that matter most, including tuition and financial aid, length and breadth of programs. Community College of Rhode Island campuses are located in four cities in the state, Warwick, Lincoln, Providence and Newport. Admissions into programs like health science classes are performance based. Admissions info sessions are geared toward current and prospective students. Sign up for the sessions is completed online. More than five academic departments offer two year vocational degrees, including allied health, engineering and technology, fire science, nursing, rehabilitative health and criminal justice and legal studies are available. Exam scores, schedules and assignments for courses at the Community College of Rhode Island can be viewed by logging into MyCCRI. MOBILE is the portal that houses MyCCRI, Blackboard, student life information, access to the digital bookstore and library and departmental information. Both public and private institutions offer career and technical education (CTE) programs in Rhode Island. High schools and several area technical centers offer classes accredited by the state. Postsecondary students may choose to pursue options at one the four campuses for the Community College of Rhode Island. Search below to find a program near you to reach your career goals. According to the U.S. Department of Education, 21,620 Rhode Island students were enrolled in career and technical education programs during the 2013-14 school year. About 8 percent of those were enrolled at the post-secondary level. According to the Rhode Island Department of Labor and Training, post-secondary certificates and associate degrees provided the education needed for more than 54,000 jobs—about 11 percent of the total—in 2012. STEM education—science, technology, engineering and math—is the career cluster with the highest enrollment. This coincides with Rhode Island’s high anticipated growth in electrical engineering technology; the state expects a 15 percent increase in the field, compared with a flat national rate. High school students enrolled in a CTE program had a 94 percent graduation rate in 2011. While the current number of people who have earned vocational certificates or associate degrees in Rhode Island is fewer than the national average, there are signs this may change over the next decade. According to the Rhode Island Department of Labor and Training, by 2022 the number of jobs requiring postsecondary certificates or associate degrees is expected to increase significantly. Students can earn career and technical education certificates while attending high school, or go on to pursue secondary education certificates or associate degrees at community college or trade schools. A lot of workers are packed into the small state of Rhode Island, meaning that earning a certificate or degree is all the more valuable in a competitive job market. In particular, the demand for workers in the healthcare industry is creating opportunities for those with post-secondary certificates and associate degrees. Those who take work as certified nursing assistants, registered nurses, and clinical laboratory technicians can expect to earn salaries 14 to 55 percent more than the national average. There’s also a bright future for those who enter the tourism industry, especially with its growing need for tech-savvy workers. With an increasing number of conventions in the state, visitors to the area need technological support that goes beyond the traditional services provided in the hospitality industry. The table below compares job opportunities for those with post-secondary and associate degrees, along with which fields have the best anticipated growth and highest median salaries. As a small state, Rhode Island’s prominent industries are synonymous with those in its capital city of Providence. Eight hospitals are located in the city, creating a demand for health professionals such as nurses and nursing assistants, as well as clinical lab technicians. Manufacturing also remains a dominant industry in Providence, providing jobs for those with backgrounds in engineering, computer science and business. Students seeking a vocational certificate or associate degree have several options in Providence. The Community College of Rhode Island has two campuses in Providence, and offers certificates and degrees in areas such as business administration, health sciences, engineering and education. Private colleges such as Providence College and Johnson & Wales University - Providence also provide areas of study focused in these fields. Schools with programs focused on specific skills include Empire Beauty School – Providence, St. Joseph School of Nursing and MoroRing Technical Training Institute, which offers certificates in marine maintenance and ship repair. Students interested in art and design may attend the Rhode Island School of Design to earn a certificate in fields such as graphic design, web design, and interior design. Provides support and resources for members through continuing education, exam discounts, access to peer-reviewed journals, job openings, and leadership training opportunities. An organization for K-12 students focused on providing resources to enhance workforce readiness and entrepreneurship through student-centered programs. They help high school students understand their options following graduation so that they may make informed decisions. A resource for students, parents and instructors, providing news updates, an overview of vocational and trade programs in Rhode Island, and advice on preparing for postsecondary education options. Members gain access to support and resources, special events, additional training opportunities, job openings, and news related to the tourism industry in the state. SkillsUSA Rhode Island Part of a national organization serving high school and college students, the focus is on preparing young people to enter the workforce in trade, technical, and skilled service occupations such as healthcare.